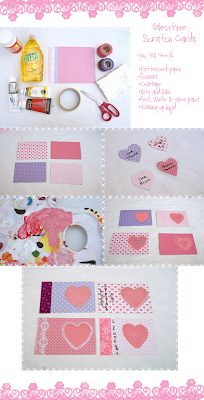 Time for the second of about seven or so Valentine crafts! 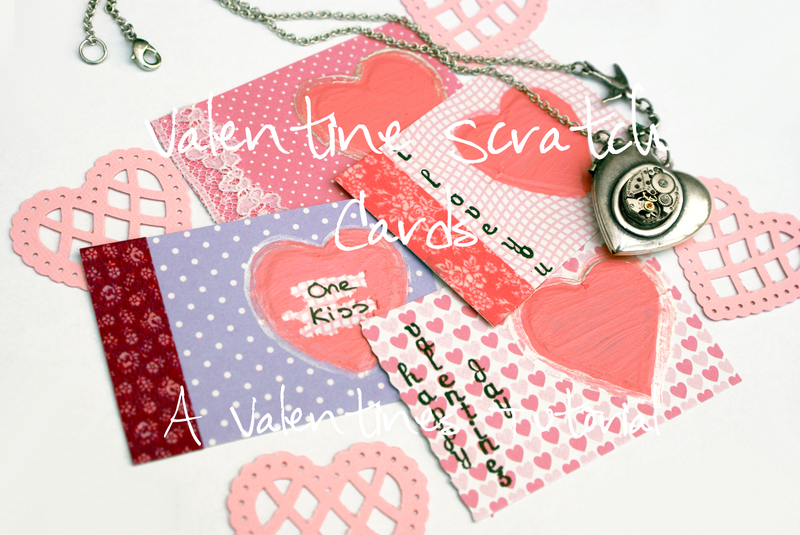 This time, I'm showing you how to make Valentine scratch cards - I know, I know, scratch cards have been done over and over again. But what's always got me is that they're always gold or silver. I suppose that's because that's what colour scratch cards are, and I will admit, if it isn't pointed out in some way, it might just look like really poorly painted hearts, but bear with me anyway. These are really easy, and you might well have most of the materials lying around! 1. First of all, take your patterned paper and cut out some rectangles (or whichever shape you desire) in your desired size. I used 6x6 scrapbook paper, and cut my cards to about the size of a business card. 2. Then cut another piece out from each sheet and cut them into hearts. You can use any paper you want from this, or you can write straight onto the paper you cut out initially. Now write whatever your scratchcard will conceal. A night out, their favourite food, or something else you know they'd like. 3. Next, cover the heart with cellotape. This will protect the paper and the writing from being ruined by the paint. Cut the tape bigger than the heart, and then cut around the shape, leaving about half a centimetre all the way around. I cut my hearts just under an inch and a half, and it took two pieces of cellotape to cover it. 4. Now stick the heart wherever you want the scratchy bit to be. That's a technical term, by the way. Scratchy bit. You can use glue on the back of the heart if you didn't leave much tape, or the tape isn't sticky enough. 5. Now mix the paint. Use the red and white to mix a nice pink if you don't already have some, then add silver to the mix to give it a gentle shimmer when it's dried. Mix in some liquid soap (one part soap, two parts paint), and then cover the heart. The extra cellotape around the edge should allow you to completely cover the heart, while at the same time not touching the card around it. The first coat probably won't look like much. It took me about four or five coats before the writing wasn't readable through it, but if you use a lighter coloured ink, you might be able to save yourself a layer. And also note that, even if you're using acrylic paint, it will take longer to dry on tape. I did a test run by sticking some tape to some paper and I roughly covered it, and found the paint dried a lot faster on the bits that got away. So after your first coat, you might be better off going and doing something else for a while. Note that you could also use the other day's valentine coupons as a base for your scratch cards! All of the writing falls in a nice box that would look lush concealed by the paint! see you in two more days for the next tutorial!